Written for Daily Hive by Mandy Gill, international plant-based ultra marathon athlete and total body-mind-spirit wellness advocate. She is the founder of the Mandy Gill Fitness + Nutrition App. Frequent visitors to the mountains, my Bernese Mountain dog, Chance, and I are always looking for dog-friendly trails, which you will find in every location listed below. At the risk of sounding like a broken record, I have to say be prepared! Weather and conditions can change quicker than you think, so it’s important to be wilderness prepared. The “Ten Essentials” are key to have you on at anytime. Bring your smartphone, fully charged and put it in airplane mode while hiking. (Information on how to prepare for your trip and stay safe while on your hike is also available from North Shore Rescue and AdventureSmart). For those new to hiking, there is a rule to follow called “Leave No Trace” or LNT. The concept is generally to pack out what you pack in and respect nature, so all future visitors can enjoy what you have enjoyed. Who can resist a 600+ year old red cedar, cascading waterfalls, boulders, and creek crossings? These are just some of the top highlights while hiking Kennedy Falls. Begin near the parking lot at the north end of Old Mountain Highway in North Vancouver. Watch for mountain bikers and trail runners as the initial section of the trail is shared use. Pay extra attention to the trail markers as it can be easy to lose the trail in some sections where there is a lot of deadfall. A ultimate favourite in our family. 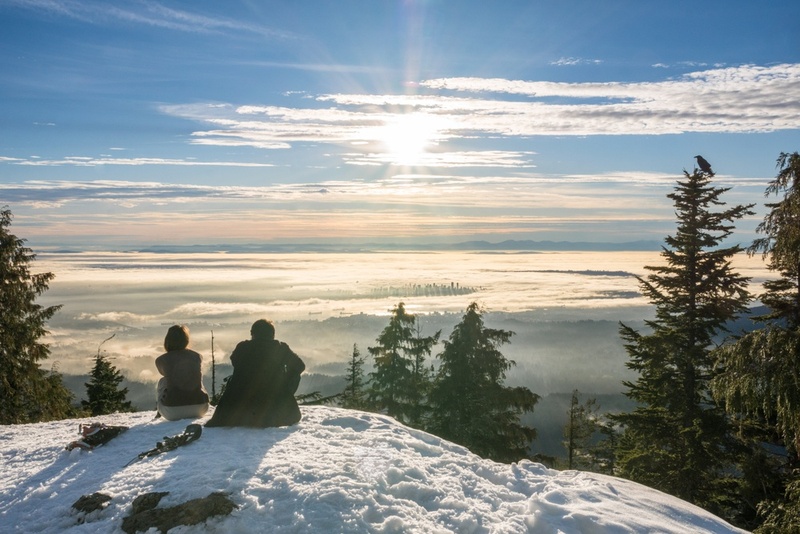 Fantastic for snowshoeing and some of the most stunning views of Vancouver! There are plenty of markers and the trail is well used so your chances of straying off-course are minimal. If you’re new to snowshoeing, Dog Mountain is the perfect place to experience what all the hype is about. Once at the summit enjoy a packed lunch and hot chocolate before heading back. The Grouse Grind of Burnaby is referred to as the Velodrome Trail. With 500+ wooden steps you’ll be sure to burn off those extra treats that may have been consumed over the holidays. With access from Barnet Highway on the north side of Burnaby Mountain, get ready to feel those legs burning before linking up with the Pandora Trail to the top. Once at the summit (hear Horizons Restaurant) enjoy panoramic views of Indian Arm, Burrard Inlet, Burnaby, downtown Vancouver, Stanley Park and the Lion’s Gate Bridge. Looking for a little extra? A longer 9.4km return route can be enjoyed by connecting the Trans Canada, Cougar Creek, Barnet and Mountain Air Trails. As beautiful as Jug Island is to hike in the summer, it’s equally (and less travelled) in the winter! Jug Island is a tiny gorgeous island located off the northern tip of Belcarra Regional Park. The island itself (at one time had stone formations that resembled a jug handle, hence the name “Jug” Island, which arch fell off some time ago). is not accessible but you can hike to a beach that faces the island and offers great views of Indian Arm. Once through the winding trails that arrive to the beach enjoy a packed lunch, and the eagles and seals that frequent the area. Did you know we have a mountain in the Lower Mainland called ‘Beautiful Mountain’? Better yet, wait till you see it in person. Swan Falls Loop (aka Halvor Lunden Trail) is a hike which takes you along Eagle Ridge, past a waterfall (Swan Falls), lakes, and over an amazing summit – that’s Mount Beautiful! It’s less travelled and full of nature. BC Hydro, who manages the area, says: “It is very steep in places and is only recommended for experienced and fit hikers.” Give yourself a full day, and get outside and play! 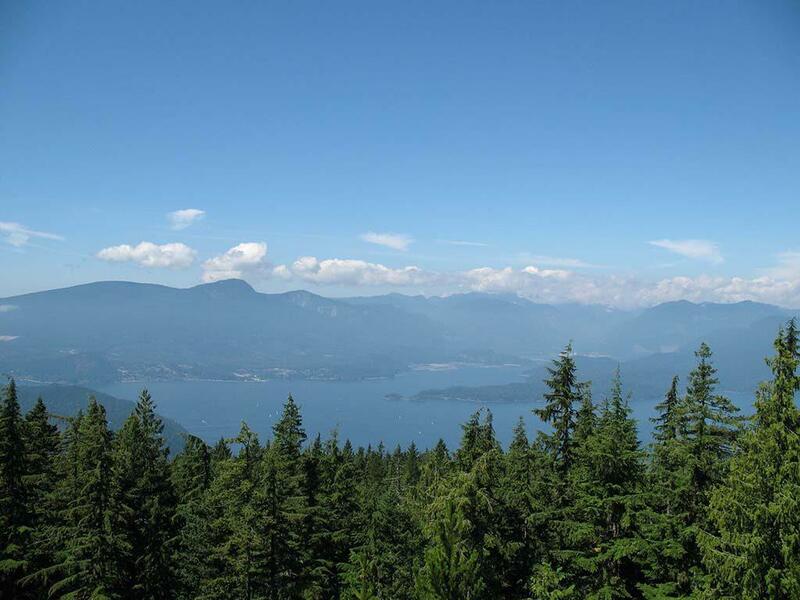 With scenic views of Cultus Lake and the Fraser Valley, this hike located in the Promontory neighbourhood of Chilliwack has a steep hike up Mount Thom and rewards you with remarkable views at the top. There are two options for hiking up Mount Thom. The one mentioned in the credentials above includes parking at the Sylvan Drive trailhead and completing the entire trail to the top. Looking for a more family-friendly option? Park near the top and do the short Lookout Loop. No matter your choice, Mount Thom is a must this winter season! Another reference to the Grouse Grind can be found in the Fraser Valley’s Harrison area. The route climbs up the side of a steep mountain along the Campbell Lake trail and embraces a spectacular view of Harrison Lake at the top! A short ferry ride from Vancouver (where sometimes you’re fortunate enough to see Orcas), offers a laid-back visit to the community of Bowen Island. Once off the ferry, a short drive away is the trailhead of Mount Gardner. 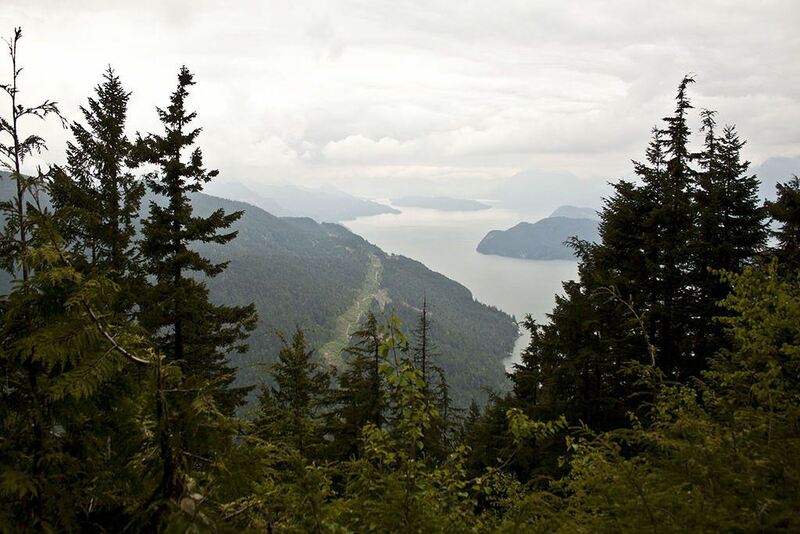 The hike offers views of Howe Sound, the Sunshine Coast, West Vancouver, and Burrard Inlet. In my opinion, any reason to head to Bowen Island for the day is a good one, but there is perhaps no better reason than for a hike to Mount Gardner.